Last month I bought an interesting RGB LED ring from Aliexpress and finally, now, it is here. So that, I’m about to present how I interfaced an STM32 MCU to WS2812B LEDs. This demo uses also FreeRTOS and HAL libraries. 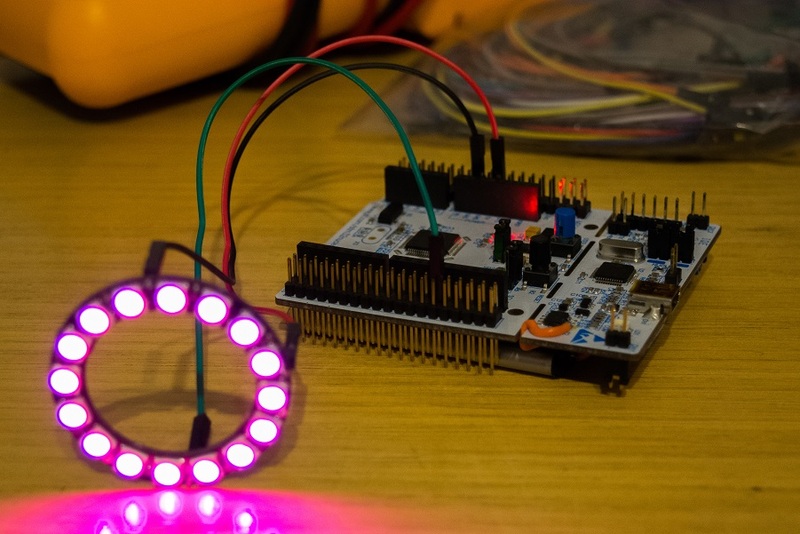 I wrote a simple code to make an STM32 interface WS2812B LEDs. “Intelligent control LED light source” in the family of the WS2812B are amazing devices (like the WS2812 and the WS2811). In particular, they are intelligent control LED light sources with control circuit and RGB driving circuitry both integrated in a single 5050 component package. They include internally an intelligent digital port data latch and signal reshaping and amplification circuitries. They are also equipped with a precision internal oscillator and a programmable constant current drive, effectively ensuring that each pixel outputs an amount of light (for each color) consistent with the one programmed. The data transfer protocol uses a single-line NZR communication mode. After the device is powered-on after reset, the DIN port receives data from a micro-controller. One of the most useful and peculiar WS2812B’s characteristic is that more than one of them can be drove with a single MCU’s line. That’s because more WS281x can be connected in a cascade fashion, as depicted in the figure below. 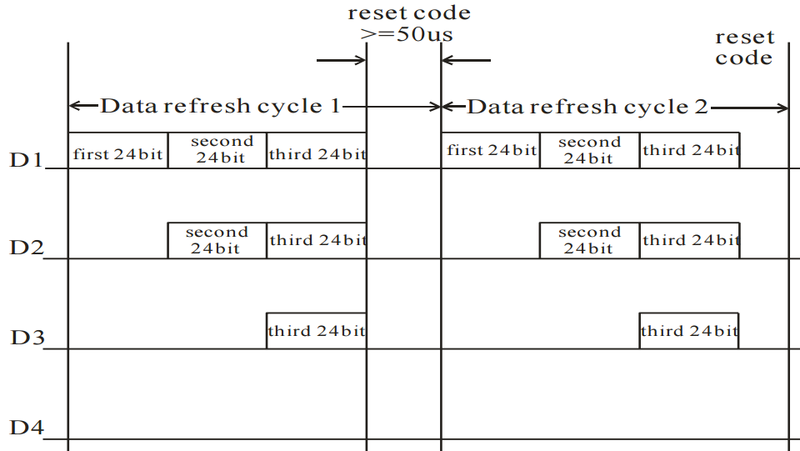 The first device (upper in the figure) receives all the data from the MCU but removes the first 24bit (these bits codify its own RGB code) and forwards the others to the next cascade-connected device. To have a clearer idea, see this figure. D1 is the first device, it received all the data and forwards all but the first. D2 (in order, the second device) receives all the data but the first and forwards, again, all the data but the first two. And so on.. This mechanism can be replicated indefinitely since each device performs a signal reshaping and amplification. This allows to reach greater distances since the signal that we output from the MCU is regenerated on each WS2812B during the way to the fartest LED. However, no free lunch. The communication follows a high frequency NRZ protocol at 800kHz. Moreover, each bit must be encoded based on HIGH and LOW times. Each WS2812B requires 24bits of data to reproduce a color. Each color is, in fact, composed of 3 groups of 8bits each that represent its RGB coding. This data must be sent following this order. The first approch is, for some ways, simpler. 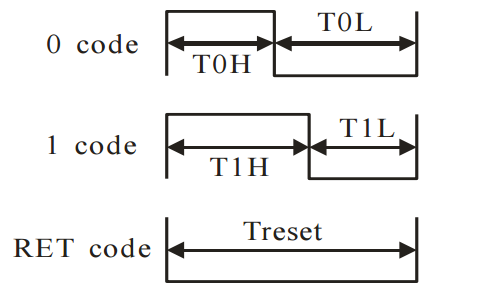 We hard code four different delays for T0H, T0L, T1H, T1L and three functions: one for sending the bit 0, one for sending the bit 1, one for reset and 0 that takes a color and generates the corresponding sequence of 24 functions. It is, obviously, not efficient and occupies our CPU for long times (especially if we connect a long strip of LEDs). The second approach, instead, aims to unload the CPU as much as possible, taking advantage of two peripherals (a TIMER and a DMA, in my case) and some of the MCU’s RAM. How to glue together all this stuff? From the datasheet, we know that every bits is characterized by a fixed period of 1.25us. This interval corresponds to a frequency of 800kHz. Moreover, looking carefully to the protocol we can notice that the only thing that changes is the high part of each period. It resembles a PWM signal. Most timers available on STM32 MCUs can dinamically generate different PWM signals. 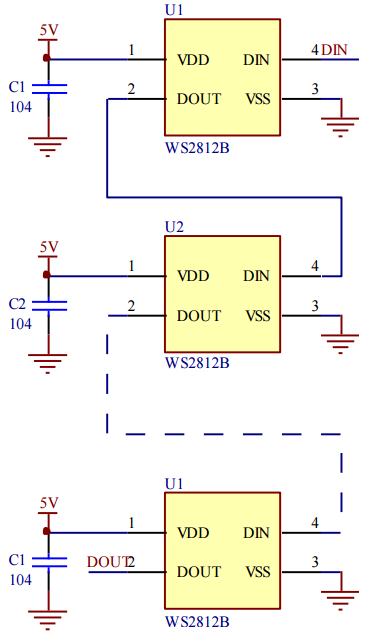 So that, changing at the right time the PWM signal generated by the TIMER, is possible to output an arbitrary series of ones and zeros following the WS2812B family specific protocol. It is not enough. If we use only the TIMER, we also need the CPU to constantly change the TIMER PWM’s high interval, thus we still load the CPU. Another peripheral comes in our aid, the DMA. It is a peripheral that basically moves streams of data from one register to another (or from a portion of memory to another, or a mix of these). Since the DMA can also made these transfers in sync with a request or an interrupt, we can use it to update the PWM generated from the TIMER. Here is one catch. The DMA is not a CPU, so it needs to move a bunch of data that is already available (and calculated). This requires that a location of memory must contain the sequence of PWMs that the TIMER should produce. The amount of memory required, is proportional to the amount of WS281x devices that we need to control. Each WS2812B requires 24 different PWMs for the color. Moreover, the RESET signal must be a PWM with no high time of about 40 (but I used 50 to be sure) periods. I am talking about number of periods because the DMA is configured to update the TIMER’s PWM value at the end of each PWM signal. So that the amount of bytes required is: 50 + 24 * #WS281x, one for each PWM period. The last step is configuring the (only) one GPIO so that it can output the PWM given by the TIMER. My ring is composed by 16x WS2812B smart LEDs, however every strip/matrix/circle of smart LEDs in the WS281x family should do the job. I used the wonderful HAL library given by the STM32CubeMX software for ST Microelectronics. It offers a really comprehensive set of instructions and configurations that allows a great speed-up in prototyping. Moreover the STM32CubeMX offers an useful functionality to graphically set-up pretty all the low-level peripherals as well as the main clock. On a higher level, I used FreeRTOS as real-time operative system. The millions of users worldwide are a guarantee of dependability and smooth operation. The following video demostrates some capabilities of the driver, drawing patterns on the RGB LED ring. All the code that I used for the demo is available HERE but the HAL libraries and FreeRTOS that can be downloaded for free on the web. This entry was posted in Development board, FreeRTOS, LiPo, NUCLEO, Project, STM32, Tutorial and tagged DIY, dma, electronics, freertos, hal, led, LiPo, nucleo, project, pwm, rgb, ST, STM32, technology, timer, tutorial, ws2812, ws2812b by Fabio Angeletti. Bookmark the permalink. Excellent write up! Thanks for sharing all your findings. I’m relatively new to ARM, do you think it should be straightforward to make this work on an STM32F411? I have a question wrt the code. The DMA controller will only pack/unpack the size differences, it will not “expand” it. Which means that each “bit” you want to PWM out will need to consume 32 bits in your memory buffer (LEDBuffer) and not 8 bits. I don’t remember how I figured out these values. It is possible that I simply wrote them and since I have not encountered any problem, I have not investigated further. Which datasheet are you referring to? I’m trying to get your code running but I keep getting errors about missing hal libraries and FreeRtos problems. I’m using the same board as you used. Could you please tell me or send me your cubeMX file so I can create a project with the same setting as you did? I don’t use CubeMX, I start with the Keil template in the HAL library and them I modify it. I’m planning a mayor migration to GitHub. Thus, all this code will be available with the samples. Did you manage to migrate to GITHUB. If so, please tell us the path.